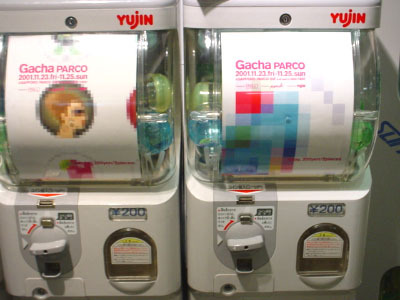 Do you know a machine which is commonly known as ‘Gacha Gacha’? This is a vending machine which can be found at toy shops or supermarkets with full of small toys in capsules. The origin of the word Gacha Gacha is that the machine makes sound ‘gacha gacha…’ when you turn a handle after you put in money. When I was small, it cost only 20 yen to play and the super car rubber was really popular. Now, it costs 100 yen and you can get various types of figures, such as Gundam. The price has risen up but you will never see a failure rubber anymore now. The quality of toys are pretty high even they are small ones and I have heard that there are many obsessive adult collectors of it. Gacha Parco was held by Ponchi Design and Sapporo Parco recently. 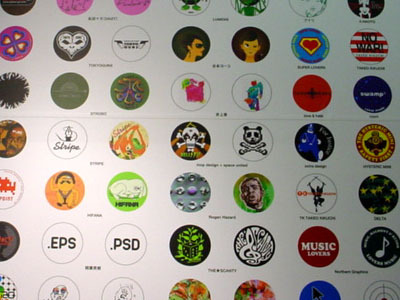 During the event people could get badges designed by fourty-four groups of creators from all over the world through Gache Gache. Eighty types of toys were prepared for this event and the white machines were placed mainly on the second and forth floor. People got two badges in a capsule by paying 200 yen. 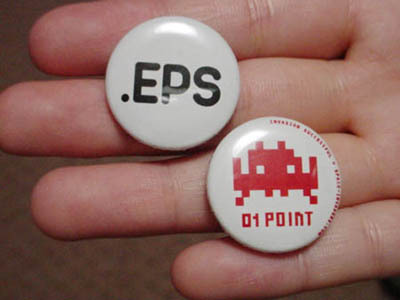 It was a wonderful idea to use badges as a mean of providing creators’ original designs to the public and people could easily get interest in it. Also, Gacha Gacha made the event more interesting by focusing on the collectors hearts. This event succeeded as a place of introducing the creators’ works. I would really appreciate this sort of good quality Gache Gache everywhere. Would you like to know my prizes? I got the Japanese creator, Hideki Inaba’s and Spaceinder’s (Paris) at the first try. Think this was a good try.